. Over the next two months, TechTank will take a closer look at the report’s findings by country and by region, beginning with today’s post on India. With about 21 percent of the world’s entire unbanked adult population residing in India as of 2014, the country has tremendous opportunities for growth in terms of advancing access to and use of formal financial services. In the 2015 Financial and Digital Inclusion Project (FDIP) Report and Scorecard, we detail the progress achieved and possibilities remaining for India’s financial services ecosystem as it moves from a heavy reliance on cash to an array of traditional and digital financial services offered by diverse financial providers. As noted in the 2015 FDIP Report, government-led initiatives to promote financial inclusion have advanced access to financial services in India. Ownership of formal financial institution and mobile money accounts among adults in India increased about 18 percentage points between 2011 and 2014. Recent regulatory changes and public and private sector initiatives are expected to further promote use of these services. 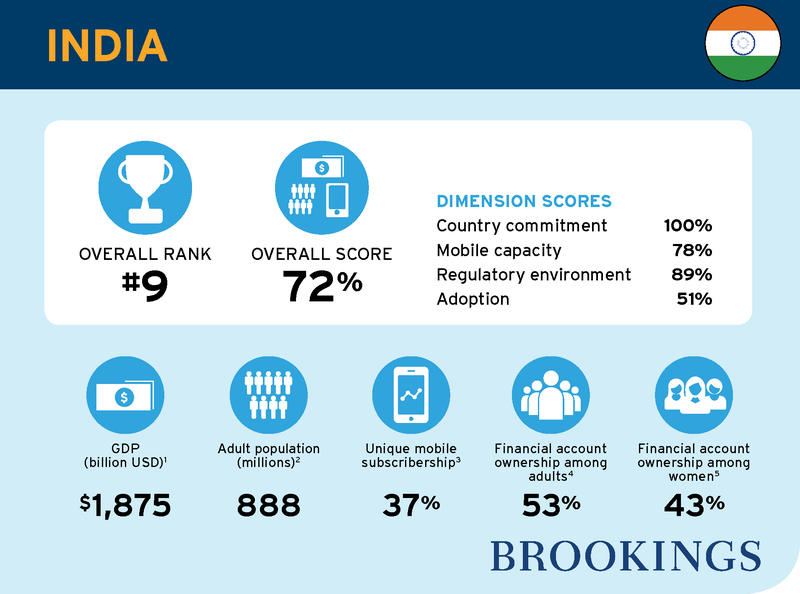 In this post, we unpack the four components of the 2015 FDIP Scorecard — country commitment, mobile capacity, regulatory environment, and adoption of traditional and digital financial services — to highlight India’s achievements and possible next steps toward greater financial inclusion. India’s national-level commitment to promoting financial inclusion earned it a “country commitment” score of 100 percent. A historic government initiative helped India garner a top score: In August 2014, Prime Minister Narendra Modi launched the “Pradhan Mantri Jan-Dhan Yojana,” the Prime Minister’s People’s Wealth Scheme (PMJDY). This effort — arguably the largest financial inclusion initiative in the world — “envisages universal access to banking facilities with at least one basic banking account for every household, financial literacy, access to credit, insurance and pension facility,” in addition to providing beneficiaries with an RuPay debit card. As part of this effort, the program aimed to provide 75 million unbanked adults in India with accounts by late January 2015. As of September 2015, about 180 million accounts had been opened; about 44 percent of these accounts did not carry a balance, down from about 76 percent in September 2014. The PMJDY initiative is a component of the JAM Trinity, or “Jan-Dhan, Aadhaar and Mobile.” Under this approach, government transfers (also known as Direct Benefit Transfers, or DBT) will be channeled through bank accounts provided under Jan-Dhan, Aadhaar identification numbers or biometric IDs, and mobile phone numbers. The Pratyaksh Hanstantrit Labh (PaHaL) program is a major DBT initiative in which subsidies for liquefied petroleum gas can be linked to an Aadhaar number that is connected to a bank account or the consumer’s bank details. As of July 2015, about $2 billion had been channeled to beneficiaries in 130 million households across the country. India received 16th place (out of the 21 countries considered) in the 2015 FDIP Report and Scorecard’s mobile capacity ranking. India’s mobile money landscape features an extensive array of services, and the licensing of new payments banks (discussed below) may drive the entry of new players and products that can improve low levels of awareness and adoption of digital financial services. An InterMedia survey conducted from September to December 2014 found that while 86 percent of adults owned or could borrow a mobile phone, only about 13 percent of adults were aware of mobile money. Awareness of mobile money is increasing — the 13 percent figure is double that of the first wave of the survey, which concluded in January 2014 — but uptake remains low. The Global Financial Inclusion (Global Findex) database found only 2 percent of adults in India had a mobile money account in 2014. Implementing interoperability across mobile money offerings, increasing 3G network coverage by population, and enhancing unique mobile subscribership could boost India’s mobile capacity score in future editions of the FDIP report. India tied for 7th place on the regulatory environment component of the 2015 Scorecard. The country’s recent shift to a more open financial landscape contributed to its strong score, although more time is needed to see how recent regulations will be operationalized. India has traditionally maintained tight restrictions with respect to which entities are involved in financial service provision. Non-banks could manage an agent network on behalf of a bank as business correspondents or issue “semi-closed” wallets that did not permit customers to withdraw funds without transferring them to a full-service bank account. These restrictions likely contributed to the country’s slow and limited adoption of mobile money services. However, 2014 brought significant changes to India’s regulatory landscape. The Reserve Bank of India’s November 2014 Payments Banks guidelines were heralded as a major step forward for increasing diversity in the financial services ecosystem. These guidelines marked a significant shift from India’s “bank-led” approach by providing opportunities for non-banks such as mobile network operators to leverage their distribution expertise to advance financial access and use among underserved groups. While these institutions cannot offer credit, they can distribute credit on behalf of a financial services provider. They may also distribute insurance and pension products, in addition to offering interest-bearing deposit accounts. We noted in the 2015 FDIP Report that timely approval of license applications for prospective payments banks, particularly mobile network operators, would be a valuable next step for India’s financial inclusion path. In August 2015, the Reserve Bank of India approved 11 applicants, including five mobile network operators, to launch payments banks within the next 18 months. As noted in Quartz India, the “underlying objective is to use these new banks to push for greater financial inclusion.” India has also made strides in terms of establishing proportionate “know-your-customer” requirements for financial entities, including payments banks. While India has made significant progress in terms of promoting a more enabling regulatory environment, room for improvement remains. For example, concerns have been raised regarding the low commission rate for banks distributing DBT, with many experts noting that a higher commission would enhance the ability of these banks to operate sustainably. India ranked 9th for the adoption component of the 2015 Scorecard. Recent studies have demonstrated that adoption of formal financial services among traditionally underserved groups is improving. For example, InterMedia surveys conducted in October 2013 to January 2014 and September to December 2014 found that the most significant increase in bank account ownership was among women, particularly women living below the poverty line. Still, further work is needed to close the gender gap in account ownership. As noted above, adoption of digital financial services such as mobile money is minimal compared with traditional bank accounts (0.3 percent compared with 55 percent, according to the September to December 2014 InterMedia survey); nonetheless, we believe that the introduction of payments banks, combined with government efforts to digitize transfers, will facilitate greater adoption of digital financial services. While PMJDY has successfully promoted ownership of bank accounts, incentivizing use of these services is critical for achieving true financial inclusion. Dormancy rates in India are high — about 43 percent of accounts had not been deposited into or withdrawn from in the previous 12 months, according to the 2014 Global Findex. More time may be needed for individuals to understand how their new accounts function and, equally importantly, how their new accounts are relevant to their daily lives. A February 2015 survey designed by India’s Ministry of Finance, MicroSave, and the Bill & Melinda Gates Foundation found about 86 percent of PMJDY account holders reported the account was their first bank account. While this survey is not nationally representative, it provides some context as to why efforts to promote trust in and understanding of these new accounts will be key to the success of the program. An opportunity for promoting adoption of digital financial services was highlighted during the public launch of the 2015 Report and Scorecard: As of June 2015, it was estimated that fewer than 6 percent of merchants in India accepted digital payments. The U.S. government is partnering with the government of India to promote the shift to digitizing transactions, including at merchants. The next annual FDIP Report will examine the outcomes of such initiatives as we assess India’s progress toward greater financial inclusion. Suggestions and other comments regarding the FDIP Report and Scorecard are welcomed at FDIPComments@brookings.edu.